A new report from Harvard Kennedy School’s Shorenstein Center on Media, Politics and Public Policy analyzed news coverage of President Trump’s first 100 days in office. To arrive at the percentages, Harvard obtained data from Media Tenor, which “codes” media according to its topic, source, and tone. The broadcast portion of the study accounts for reporting on CNN’s The Situation Room, CBS Evening News, Fox’s Special Report, and NBC Nightly News, but does not represent talk show coverage. Newspaper analysis incorporates all sections but obituaries, sports, and letters to the editor. President Trump has received unsparing coverage for most weeks of his presidency, without a single major topic where coverage, on balance, was more positive than negative, setting a new standard for unfavorable press coverage of a president. Every news outlet in the study was negative more often than positive. 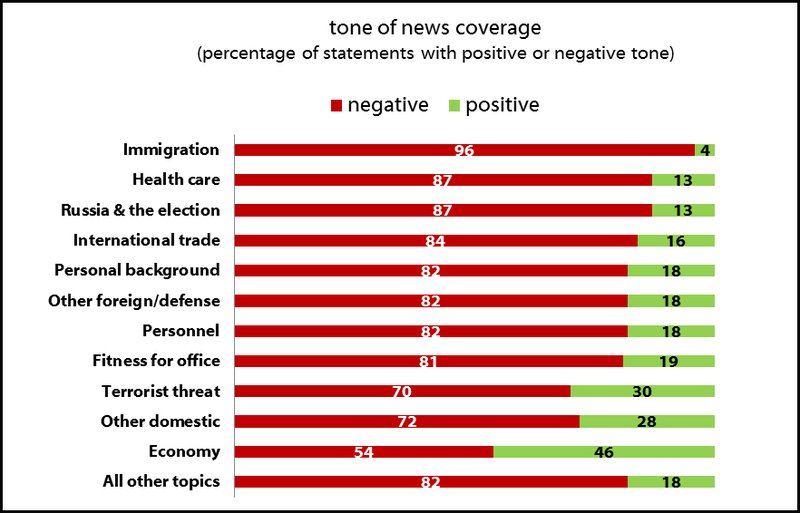 On the economy, news reports were still negative, but less negative than other topics – 54% negative to 46% positive. It should be difficult to publish negative stories about the economy when it is improving. A third major part of Harvard’s study compared coverage of President Trump to that of the three previous presidents – Barack Obama, George W. Bush, and Bill Clintons’ first 100 days. President Obama, who received 41 percent negative coverage and 59 percent positive coverage. “The media needs different narrative frames [when reporting on President Trump] – not just an antagonistic one,” said Nicco Mele, director of Harvard’s Shorenstein Center, to The Daily Caller News Foundation. 1. How do you think persistent and widespread negative coverage of President Trump affects the way people view him and his administration? 2. What to you do to avoid being influenced / having your views shaped by the media? CHALLENGE: Check out the editorial cartoons found at several of the media sources evaluated in the Harvard study. What percentage of the cartoons about President Trump are positive? negative? neutral?